How to show Unique ID value on the "Thank You" page? Having the Unique ID displayed in the Thank You form would be awesome - can you please tell me how to do so? Also, can the unique ID be shown in the Autoresponder that a person who fills out the form gets in their email inbox? 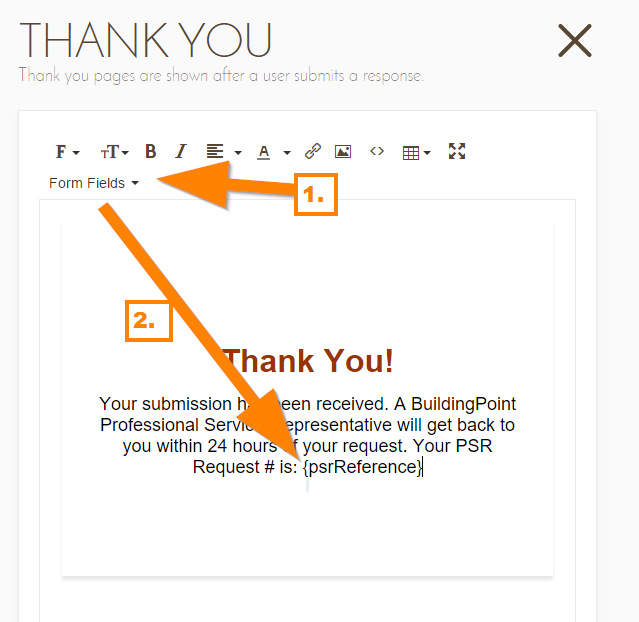 You can use the field tag or add it in your "Thank You" message by clicking the "Form Fields" drop down at the text editor. For the concern regarding the autoresponder, I have answered your inquiry on this thread: http://www.jotform.com/answers/752123. However, it seems like you have already resolve the issues. If you need anything again, please do not hesitate to open a new thread here in the forum.